Download now in the iTunes App Store. 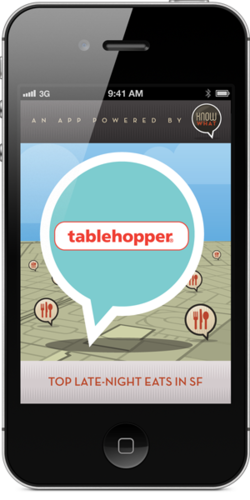 UNFORTUNATELY THE DEVELOPERS BEHIND THE TABLEHOPPER APP NO LONGER EXIST AND THEREFORE CAN NO LONGER SUPPORT IT, SO THEY HAD TO TAKE IT DOWN FROM THE APP STORE. AS SOON AS I CAN FIND ANOTHER APP DEVELOPER, WE WILL REISSUE THE APP. THANKS FOR UNDERSTANDING. In a city that likes to shut down at 10pm, Tablehopper’s Top Late-Night Eats in SF definitive app is essential for anyone who likes to eat and drink after-hours. The tablehopper recommends more than 95 San Francisco restaurants, cafés, taquerias, pizzerias, sandwich shops, and more that serve food past 11pm. Each listing has a short blurb about the vibe and the must-order dishes—and it’s written in the trademark tablehopper sassy style (oh you know it!). The app is GPS-enabled and lists the business hours (crucial!) and other info, like the website, address, cuisine, etc. And the tablehopper should know—Marcia has been writing about San Francisco Bay Area restaurants since 2002, and is the author of the book The Tablehopper’s Guide to Dining and Drinking in San Francisco: Find the Right Spot for Every Occasion.